DOC runoff effects on coastal Baltic Sea spring bloom communities. Project lead: Timo Tamminen. April-May 2019. Exact timing to be confirmed. Other initiatives will be carefully evaluated as well. AQUACOSM approved TA users are welcomed for August-December 2018, based on negotiations with interested applicants and depending on the size of the group. SYKE-MRC laboratories have been moved into new premises. We have on average 110 person-days TA allocated per year (for three years). In 2018 we could host 1-3 groups of 2-4 persons, for experimental periods lasting 10-30 days (totaling max 110 person-days). The main effort of SYKE -MRC indoor facility in 2018 will focus on R&D on automated sampling and measurement systems to be developed in AQUACOSM WP8. TA connected to testing and demonstration of new sensors applicable to flow-through measurements of planktonic systems, as well as innovative automation of sampling procedures, are thus particularly encouraged. Our basic mesocosm facilities include 300-liter transparent indoor units, with controllable light and temperature conditions. We host a full range of indoor experimental units from 10-1 to 102 liter scales for specific experimentation, either as separate R&D projects (cf. above), or in connection to mesocosm activities. Depending on experimental targets, mesocosms/units can be filled with cultured organisms (joint SYKE & Tvärminne phytoplankton culture collection, including hundreds of species strains) or natural waters transported from brackish or freshwater environments. These logistics need to be negotiated on a case-by-case basis. 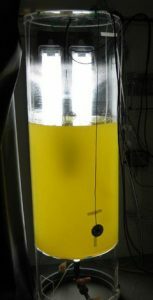 We offer excellent analytical support for TA, especially connected to plankton dynamics, as the indoor mesocosm facility is a part of the SYKE-MRC laboratory. This support can be negotiated to contain a variety of chemical, biological and bio-optical analyses, with advanced imaging and sample preparation possibilities. The applicants are strongly encouraged to contact us to negotiate most fruitful possibilities prior to submitting their proposals. The SYKE-MRC Mesocosm Facility is part of SYKE’s Marine Ecology Laboratory, offering indoor experimental systems in a range of volumes up to 300 l. Temperature and light conditions can be well controlled. The facility also has several walk-in climate chambers and provides access to modern laboratories equipped with a wide range of instruments, including advanced bio-optical methods, such as a flow cytometer, imaging FlowCAM, high-quality microscopes, a spectrophotometer with an integrating sphere, spectrofluorometers, FRR fluorometers, plate readers, controllable LED panels, nutrient analysers, and an isotope laboratory. Furthermore, the Mesocosm Facility is associated with a phytoplankton culture collection that includes hundreds of strains and can be used in experimental studies. In addition to ecological experiments on plankton, the indoor mesocosm facility provides an attractive platform for methodological R&D investigations by external users (e.g. topics related Blue Growth or instrument development and testing under variable but controlled environmental and biological conditions). A total of at least 336 person-days will be allocated to external users through AQUACOSM Transnational Access provision in years 2-4. Access is offered to a minimum of 4 persons for an average of 20 days each year. Access costs will be declared on the basis of a combination of Unit and Actual Costs (186 € and 165 € per user-day, respectively), the latter covering specific support from SYKE-MRC staff. Services currently offered by the infrastructure: External users have full access to the SYKE-MRC Mesocosm Facility and benefit from additional support provided by the associated facilities. Technical and analytical support by experienced staff is available when costs are covered. 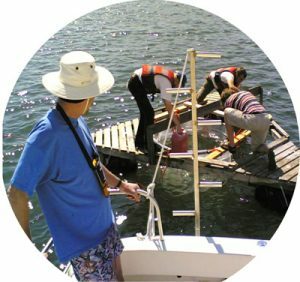 Access to the basic facility includes preparation of mesocosms for experiments or other uses, including sampling and sample transport of natural water or organisms, basic physico-chemical and bio-optical monitoring of the experimental units, equipment for sampling and sample preparation, a wet-lab and laboratory benchspace needed by users bringing their own instrumentation. Comparisons, calibration and validation of bio-optical instruments, as well as tests of real-time data acquisition systems, represents specific expertise of the scientific staff, which is offered to external users. See also WP8. Support offered under AQUACOSM: Users under AQUACOSM have access to the indoor mesocosms, lab space, instruments and service by scientific, technical and administrative staff. to lab space and the associated facilities, to standard disposables and administrative and logistic support and to laboratory services listed above, as agreed upon in a user-access contract. Staff will provide training in the use of the facilities where necessary. Advanced technical or analytical support by SYKE-MRC researchers and laboratory technicians is available upon request within the limits set by available Actual Costs.